Home >> Generated from JAN's SOAR Information System on 4/26/2019 4:30:11 AM. When your laptop could use a little height, the Innovative Height Adjustable Laptop Mount has all the features in an adjustable laptop arm you would need to bring you into a new era of working - ergonomically. 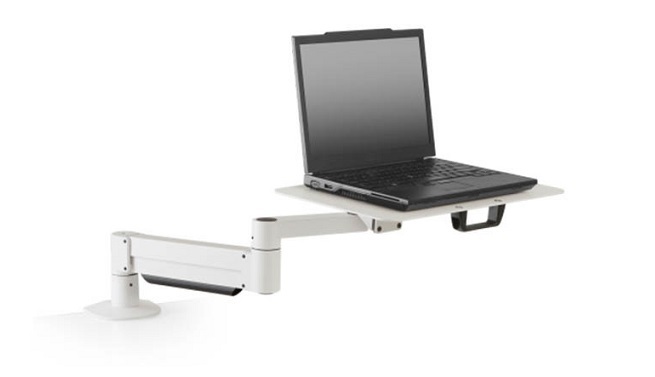 The adjustable arm can be easily positioned with one hand, giving you ergo-friendly viewing for your laptop where it's more comfortable for all of your tasking. The ready-to-use laptop holding tray is perfect for grab 'n go moments when you'd rather not fidget with attachments. Simply set on the 17 inch by 10 inch tray and secure with the included Velcro straps for a stable new home for your laptop computer.